No brioche. Pancakes sans flowers. Staple owner Evan Lindau (ex-Allpress) wants to be known for simple food done well. Toast. Bacon and eggs. 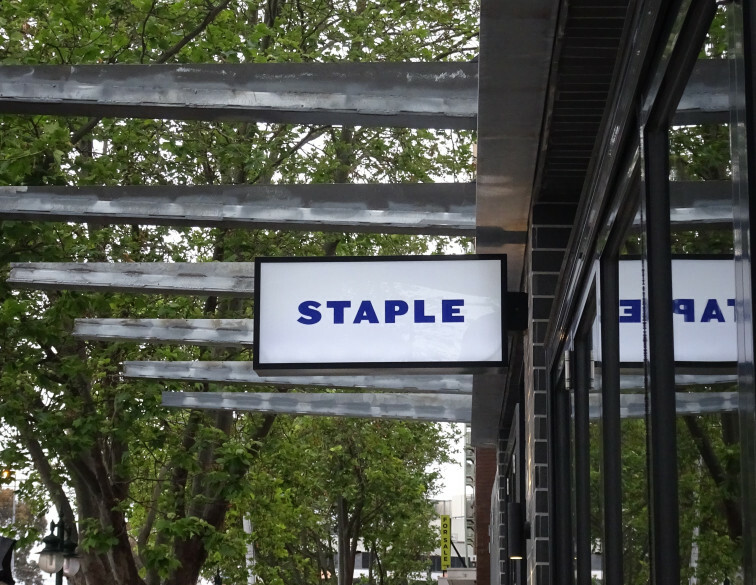 The staples – hence the name. Looks-wise, it’s a far cry from Lindau’s previous cafe, Footscray’s Guerilla Espresso. At 150 square metres, the buzzing split-level tenancy is six times the size. It also has a sharp fit-out by Samantha Eades (Chin Chin, Rock Sugar, Mr Miyagi), rather than being a DIY Thai-DVD-store conversion. Quality coffee is still a focus. Rumble Coffee Roasters’s Shadow Boxer blend is used for white coffees; and Omar & The Marvellous Coffee Bird’s Tade GG (an Ethiopian blend) in black. For breakfast our pick is the For Two: four eggs, toast and five sides for $40. Lunchtime liquor is available and true to the mission, it’s kept simple. One beer, one red and one white wine. At the mini providore you can buy good-quality organic produce sourced from more than 10 suppliers, from organic potatoes and gourmet sauces to Who Gives a Crap toilet paper. Residents from the upstairs apartments can order a “staples essentials box” delivered to their door, with a week’s worth of Lindau’s curated deli items. The cafe comeback is on in St Kilda. Riding the wave of desirable dining destinations in the area is Staple Providore. 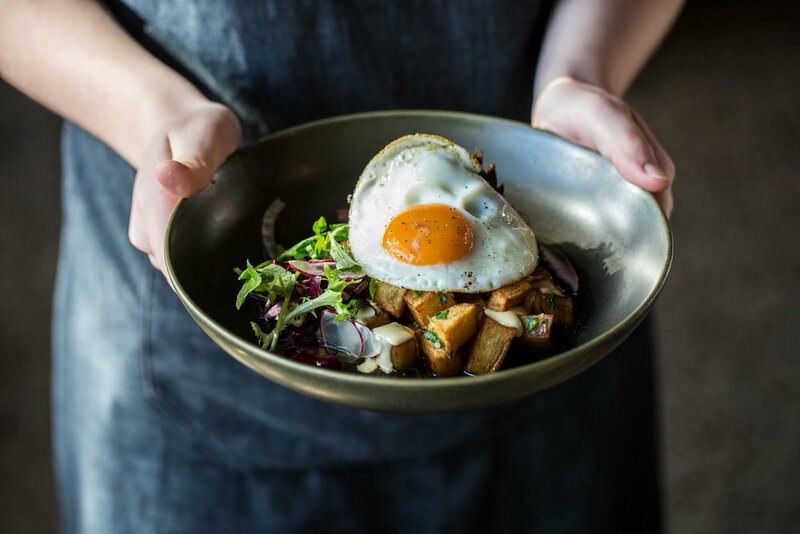 Located near the leafy St Kilda Road end of Fitzroy Street, owner Evan Lindau’s newest cafe offers brunch lovers flavours that stand the test of time. The menu collaboration between Evan and chef Johnpaul Dargan references classic European techniques, and uses ethical and local produce from small suppliers such as the Goulburn Valley’s Burd Eggs and Ballarat’s Country Style Smallgoods. For meat-eaters, there’s slow-cooked O’Connor beef brisket with horseradish aioli and a fried egg, or Port Lincoln sardines on crushed kipfler potatoes with a kalamata olive tapenade, roasted fennel salad and a saffron beurre blanc. Vegetarians will go wild for the baked eggs with garlic, mushrooms, pecorino and preserved lemon, as well as the corn fritters with a green tomato salsa and poppy-seed yoghurt. Other highlights include the kaiserfleisch bacon, saganaki with honey, pancakes with strawberries, maple syrup and lemon sherbert ice-cream. There’s also a dish called Staple For Two. For $40, it includes eggs and toast for two people, with five sides to share. For coffee lovers, the cafe uses Rumble beans for milk coffees and Omar & the Marvellous Coffee Bird for espresso. Batch Brew and rotating V60 filter coffee are also a focus, with guest roasters such as Market Lane and Dukes – so watch this space. As for the venue’s interior, Evan’s new spot is a step up in size from his former Footscray hole-in-the-wall cafe, Guerilla Espresso, which won him The Age Good Food Guide Best Small Cafe Award in 2014. Designed by interior specialist Samantha Eades, the space is expansive and bright, with terrazzo flooring, a gorgeous green Moroccan-tiled arch and bifold doors that open to the street. Check it out now. Open 7am-4pm weekdays, 8am-4pm weekends. Tired of same-same cafes still circulating Melbourne’s hospitality scene? Enter the new hospitality culture, heralded by the recently opened Staple café at the leafier end of St Kilda. At Staple, occupying a narrow-but-long 100sq m space at the leafier end of Fitzroy Street, patrons can not only perch or sit inside or out for coffee and food, but also stop by the café’s temporary or fixed retail stations for a box of toilet paper, milk and eggs from the fridge or fancy anchovies and tins of tomatoes from the providore. It’s an example of designers today responding to a new culture of hospitality, where retail, dining and curated interactive experiences are thrown into the mix, providing new ways to engage with space and staff beyond a typical café transaction. Read the full story in the latest edition of Indesign Magazine, #69 – the ‘Think Big’ issue. Other awards went to Collingwood's Everyday Coffee (best brew bar), Guerilla Espresso in Footscray (best small cafe) and Industry Beans, Fitzroy (best boutique roaster).